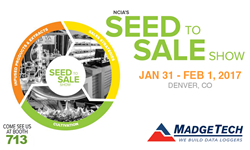 MadgeTech is excited to be heading back to Denver, Colorado on January 31st through February 1st for the Seed to Sale Show hosted by the National Cannabis Industry Association. With more than 2,000 industry professionals expected to be in attendance, MadgeTech will be showcasing the new line of Element data loggers, specifically designed to simplify the monitoring of environmental grow conditions. NCIA is the largest cannabis trade association in the United States, and the only organization to represent the growing number of cannabis businesses at a national level. The two-day show is the only national show focused on the latest innovations and best practices to put to use throughout the entire life cycle of the plant. Designed with growers in mind, MadgeTech Sales Engineer, Ken LaPage, will be highlighting the convenience of the Element wireless data loggers. Whether growing indoors or in a greenhouse, the Element series provides real-time monitoring from any internet enabled device, anywhere it the world. This is crucial for growers who need to keep a constant eye on their crop. Users also have the option to set alarms along with email and text notifications to be informed immediately of any changes in the grow facility environment. MadgeTech’s Element HT data logger is for growers who just need to focus on the temperature and humidity of the growing environment. This product allows growers to react and control the changing needs associated with different growth cycles to maximize the harvest, while preventing mold and disease. For growers introducing CO₂ into the environment, but are also concerned about fluctuating temperature and humidity levels, MadgeTech offers an all-in-one solution for acquiring a complete profile. The Element CO₂ is equipped with a sensor affixed to a 16 foot cable to allow for remote placement and monitoring of CO₂ levels, while also simultaneously recording temperature and humidity levels. MadgeTech also offers a solution to address the challenge of controlling the pH levels of water and nutrients. The portable pHTemp2000 data logger provides growers with the data to establish the soil composition instantly, right in the palm of their hands. This device is compatible with many commonly used pH and ORP electrodes, as well as RTD probes to measure temperature. The Seed to Sale show is generating a lot of buzz and attendees will include growers and cannabis business owners of all levels from all parts of the country. We hope to see you there!